There are literally thousands of entries at pub med related to low glutathione levels. Conditions ranging from the neurological or brain, to cancer, to autism and irritable bowel syndrome. Glutathione exists in all mammalian cells, and provided the liver is functioning well, in energy producing mitochondria. It’s pervasive and important nature as your primary antioxidant and cellular protector means that Glutathione is correlated with most diseases. 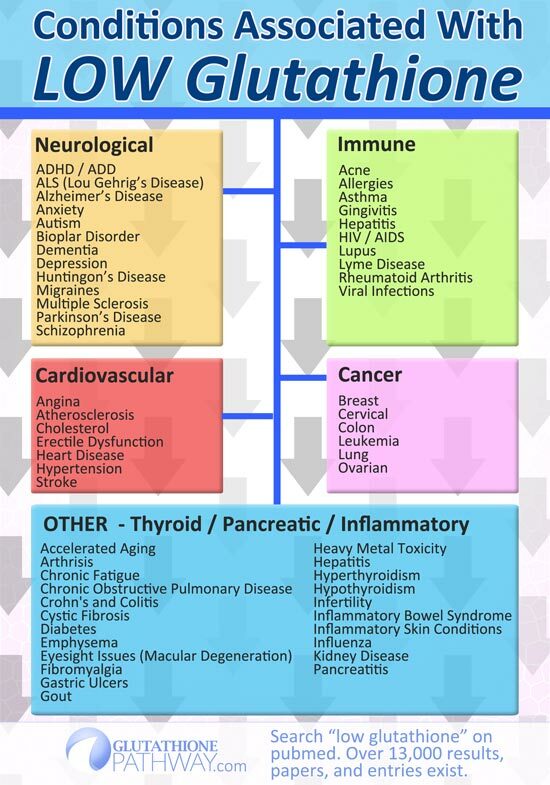 Any inflammatory issue, disease, or toxin, seems to deplete GSH, leaving the body susceptible to further damage, and creating the potential for a degenerative cycle. As you age this only gets worse, and why glutathione is very much part of modern anti-aging research.